...but not with this one. Frankly, I'm tired of a) having to defend my position as a Mets fan and b) having to listen to baseless hyperbole like the above quip. Oftentimes, jokes like this are merely indicative of more herd-mentality, knuckle-dragging on the part of the jokester; usually, this comedic-genius has heard someone else say it and thought that they, themselves, would get some cheap laughs at the expense of the Mets. 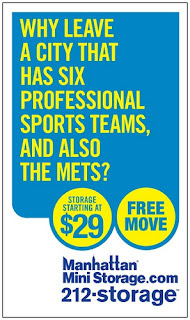 Little fact checking has been done to see whether or not these claims have any basis whatsoever; it just seems to be a running gag that the Mets are a perennially terrible team. Now, granted, the Mets are not the exemplar of baseball par excellence and, worse, they are, essentially, the kid brother to the Yankees and their twenty-seven championships. I would never try to compare the Mets to the Yankees because, honestly, there is no comparison. The Yanks beat the Mets in every category that matters from total team championships to quantity of greatest-of-all-time players. Instead, I would like to make the argument that the Mets are no worse (and, in some cases, are better) than the denizens of the Garden: the New York Knicks and the New York Rangers. A caveat: I hate the Knicks. This is a well-known fact. With that said, though, I must make it quite clear that I am not looking to besmirch the Knicks or to offer any backhanded criticism/take unnecessary swipes at them. To do so would be hypocritical since I am attempting to make a case for why people should stop doing that very same thing with the Mets. I will rely solely on the statistical facts that I have uncovered in my research to plead my case. The Knicks and the Rangers have some of the most passionate fans in all of sports. The building that both play in is called "The Mecca" of the basketball world. Both franchises have had their ups and downs, with the former having particularly horrendous front-office issues (much like the Mets)...and yet, still, little comparison is drawn between either organization and the Mets. 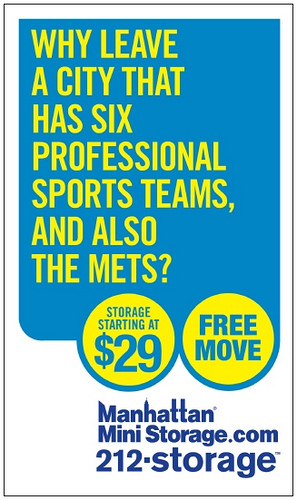 The Knicks and Rangers are "winners" whereas the Mets are always "losers." I would argue, however, that such labels are misnomers and that the lines that separate the success of all three teams are much blurrier than most people think. For the purposes of my argument, I researched 25 of the previous 26 seasons (not including the current one as the Mets are still playing) from the 1985-86 hockey & basketball seasons (1986 baseball) through the 2009-10 seasons (2010 for baseball). I first looked at the win/loss percentage for each season and whether or not the teams reached the playoffs and, ultimately, the conference of league finals. I then tallied the average win/loss percentage for the full 25 seasons (24 for hockey as one was locked out), the maximum win/loss percentage (e.g. best single season record), the worst win/loss percentage, the total number of seasons with records at or above .500, and, finally, the percentage of finals-per-playoff appearances. The latter is meant to demonstrate each team's ability to capitalize on its playoff appearances. Of the three teams, the Mets are the statistical leader in all but two categories. Historically, over the twenty-five season period, the Mets have a better win percentage (.5141) than both the Knicks (.4937) AND the Rangers (.4555). While the Knicks had the best single season at .732, the Mets have never had as poor a record as either the Knicks (who had a .280 season) or the Rangers (who had a.3048 season). Mind you, the Mets have played roughly DOUBLE the games of either the Knicks or Rangers during this period and still have managed to show superior consistency. Even though the Knicks made 15 trips to the post season (and the Rangers 14), the former appeared in either the Conference Finals or NBA/NHL Finals 4 and 3 times, respectively. The Percent Finals Per Playoffs is in the mid to low twenties for both teams. The Mets, conversely, have made either the League Championship Series or the World Series in ALL FIVE PLAYOFF APPEARANCES. Granted--the Knicks and Rangers have triple or roughly triple the appearances...but the Mets contended more than either time. Again, though the Mets have fewer trips, in 100% of their playoff appearances they were playing for a pennant or for the overall championship. What's more important: making more trips and losing almost 75% of the time before reaching the ultimate or penultimate round, or making fewer trips but making them all count? The subjective analysis is up to you, the reader. The only point of contention I take with saying that the quantity of the Knicks' and Rangers' playoff appearances is superior to the Mets' is the fact that the playoff systems of both basketball and hockey favor those teams making it whereas baseball's format does not. In basketball and hockey, a whopping SIXTEEN TEAMS make the playoffs each season; that's approximately half or MORE than half of the total number of teams in the league! With baseball, only division winners made the playoffs until 1995 when the wild card was added. Basically, if the Mets didn't win the division prior to 1995, they weren't making the playoffs. That might not seem like a big deal but when you take into account the fact that the late 80s/early-to-mid-90s saw the National League dominated by the Atlanta Braves, it becomes clearer just why the Mets weren't making it. A comparison, for fairness: the Braves were to the Mets as the Bulls/Pistons were to the Knicks and a slew of teams were to the Rangers. If you look at all of the seasons that the Mets did NOT make the playoffs but finished SECOND in the division, it would be arguable that they might have made the playoffs with either a wild card or "top 8 teams from each league" playoff set up. This would bring the total number of years with post season visits up from 5 to 12. Still fewer than either the Knicks or Rangers but much closer in comparison. So, basically, and in conclusion, the Mets have a better overall regular season record over the past 25 years than both the Knicks and Rangers, more seasons above .500, more championship appearances...and yet somehow they are bastardized while both of the latter are heralded as pedestal-worthy teams that play in the most illustrious arena in their respective sports? Give me a break! And, more importantly, give the Mets one.